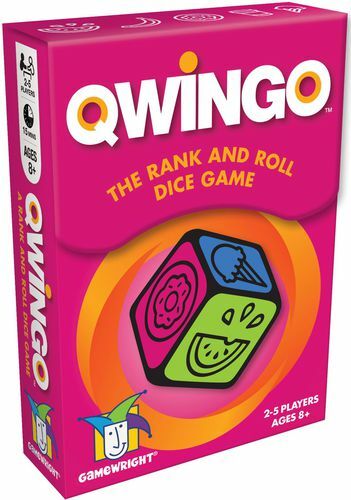 Qwingo is a 2018 reprint of Top 12, originally done by Schmidt in 2015. In this game, players get a scoresheet with 5 columns on it, each with 12 spaces. Each of these five columns is topped by a colored icon to identify it. To start the game, each player writes the numbers 10, 20, 30, 40, and 50 on their sheet such that each column has one number in it to start the game. 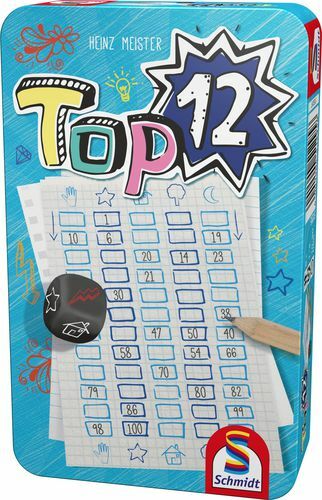 As you play the game, when you write numbers in columns, they must be written in ascending order when looking top to bottom. A start player is chosen, and that player takes the first turn. He first calls out a number from 1 to 100, and then rolls the die. The die has 5 faces that correspond to the 5 columns on the scoresheet as well as a black/silver lightning bolt. Players write in the number in the column that is seen on the die. If the lightning bolt comes up, you can write the number in any column. If you cannot legally write the number down (because remember that the numbers in each column must be in ascending order), you must pass on writing anything down. The next player then calls out a number, rolls the die, and all players again write down the called number if possible. When players are calling out numbers, it is acceptable to call out a number which was already used in a previous round. You may also want to look at the sheets of the other players to find numbers which help you alone. 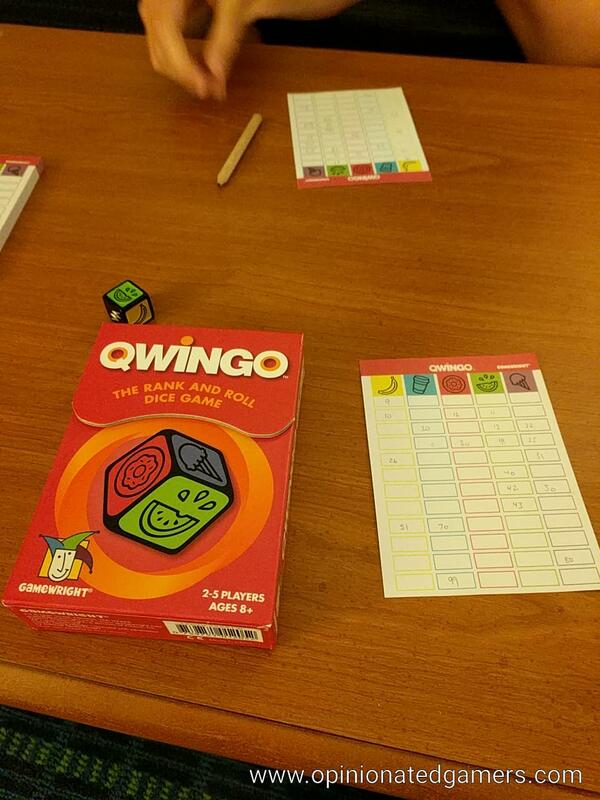 As soon as a player has filled in an entire column with 12 numbers, he yells out “Qwingo” and wins the game. If there is a tie, the player with the most numbers filled in another column wins. Roll and write games have been all the rage this year, so it’s not surprising to see companies trying to cash in on the genre’s popularity. The game here is brutally simple, and while that simplicity makes it easy to teach, it also somewhat limits the decision making. The scoring sheets will start out slightly different assuming that the players choose to place their starting numbers in different arrangements – but as the rest of the game continues, most of the numbers will end up in the same relative place in the same columns. As all players know that the numbers must be in order in a column, it’s not like there’s that much variation in the general area of the column that a number will be placed. The players will naturally diverge a bit each time that the lightning bolt is rolled as the columns will then start to differ a bit. The game moves along quickly until the end – usually players will be close on different columns, and then it’s just a matter of calling out the number you need and then hoping that you roll the right face on the die to win. It can drag out a bit at that point, but games still usually end within fifteen minutes. As I said, it’s a really simple game – one that is worth playing a few times, but maybe not one that will make an all-time great list.